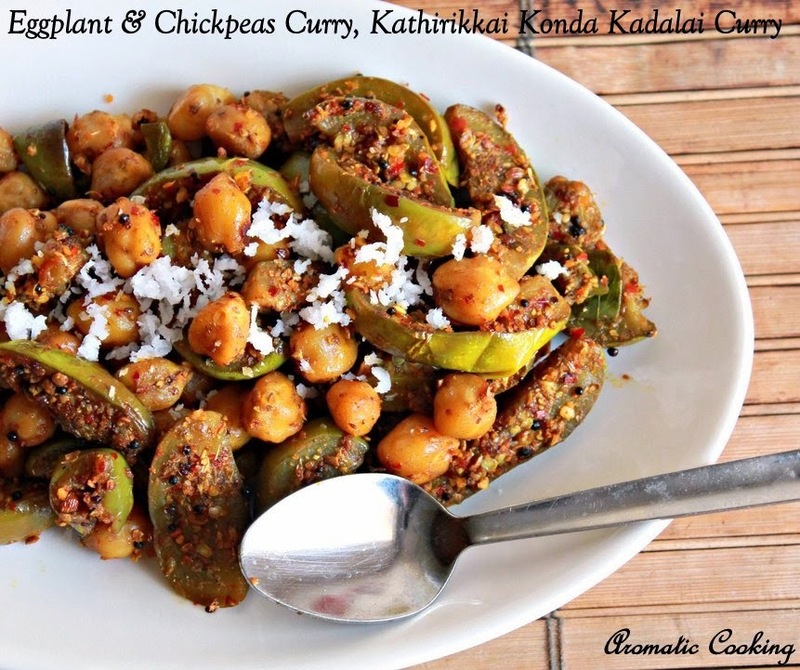 Chickpeas/ chana/ garbonza beans dishes are a favorite at home, especially, chana masala. Cooked chickpeas can be added to salads, to mixed rice and also pairs well with almost any vegetable in a curry. I love it with potatoes, eggplants, spinach, the list goes on. Usually, I add it it only to a gravy, this time I thought I'll make a dry curry with chana and kathirikkai/ eggplant/ brinjals. 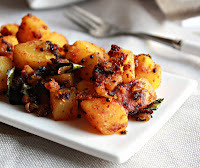 This curry is again like the Kathrikkai Podi Curry, only with a slight variation in the ingredients for the spice powder. 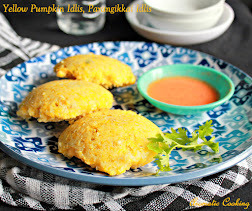 It goes well with rice and sambar, any mixed rice or can be even served with rotis along with some raitha..
Roast all the ingredients given under ' to powder ', except the coconut, switch off and then add the coconut and mix, cool and powder it. 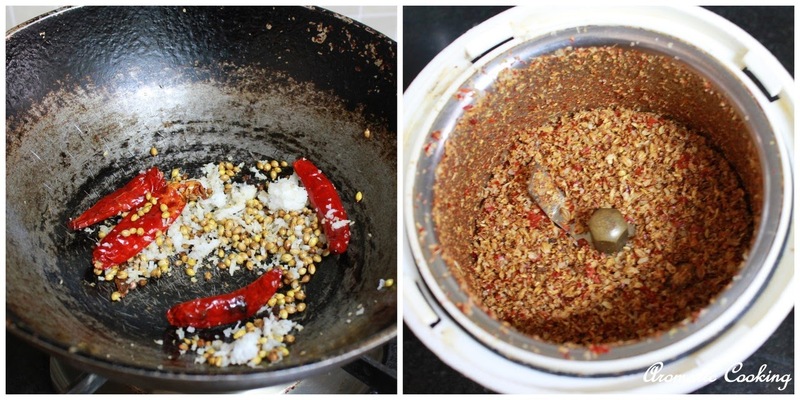 Heat some oil, add the mustard seeds, when it starts spluttering, add the asafoetida followed by the curry leaves. 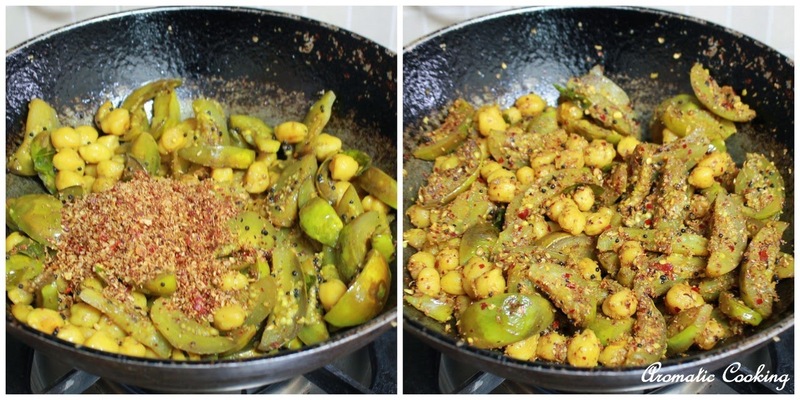 Then add the sliced eggplants, cooked chana and mix. Add the turmeric powder, salt and sprinkle some water, cover and cook on low heat till done. Then add the spice and coconut powder, mix and keep cooking for 2 to 3 minutes and remove. Garnish with some fresh coconut and serve. 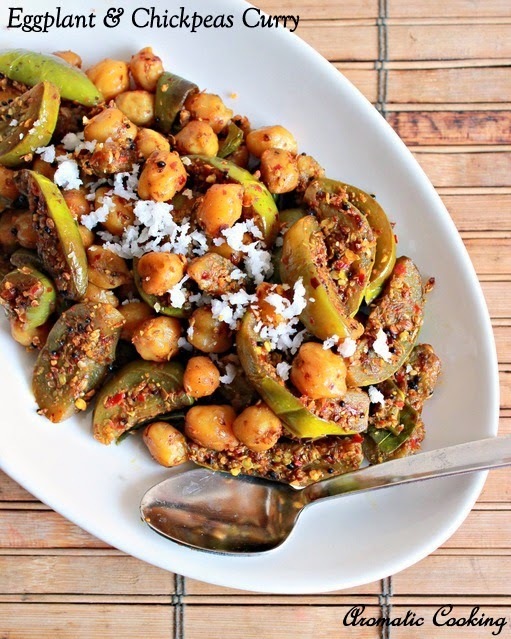 If the cooked chickpeas are very soft to touch and if you feel, that they would break down further if cooked with the eggplants, then add it along with the spice powder and mix. Mine was cooked like we do it for sundal or salad, so I added along with the eggplants. healthy and tasty curry. 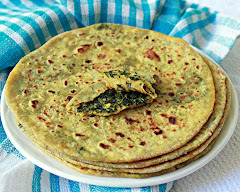 Love to have it with roti. Yumm..
Lovely combo ! looks yummy ! I had this combo in some form of gravy. Looks good. Vegetable with Channa is very healthy. Hema you make unique combo of curries love this one with eggplant and chickpeas. 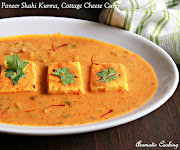 Nice combo, and the curry looks delicious..
delicious n spicy looking curry.. Very different and nutritious curry..lovely platter. Both chickpea and eggplant are my favourites. Love the curry. Thats a nice dish Hema! Now that I have becomes friends with Brinjal, I have been looking for some brinjal recipes. 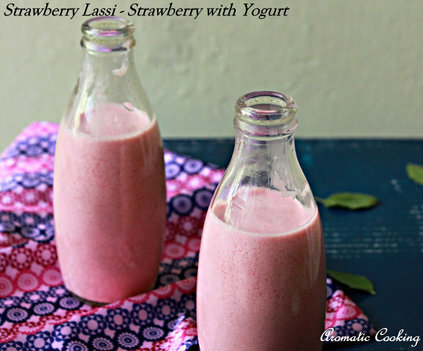 Healthy and delicious combination.. love it!! This looks amazing! I love the powder part of the recipe. I'm definitely going to make this. Chickpeas are a staple for many of my dishes, but I love them best with curry.